It is disturbingly common for adults, usually those of my age or older, to think that the younger generation has gone to the dogs. Of course, that’s really about two generations now, but let’s not quibble. This week’s news should put that idea to rest. On page 1, we have stories about two quick-thinking youth, both 14. One pretty much saved his house from burning down after a super-heated current jolted the wiring after a transformer blew in Mahopac, and the other quickly led rescue personnel to the site of a man who, with his ATV, had fallen through the ice in Putnam Valley. Their names are Zachary Kuttruf, in the case of the ice rescue in which minutes surely made the difference, and Joseph Nikisher, who alerted his father, the Mahopac fire chief, to the problem. Joseph then picked up a portable extinguisher and put out multiple fires in his home, after 13,000 volts had overwhelmed the meter and wiring. Friends, you can’t read about youth like these two young men and despair for our nation. Indeed, this initiative and responsibility, at the tender age of 14, speaks highly of them, their parents and communities. Washington so often seems like a train wreck, with a new collision every week. If you do nothing else this week, do this: Don’t despair. The young people will be in charge soon, and some of them are pretty damn bright. When I was a youth on the farm, ice cream was a treat, period. Who wouldn’t be satisfied with a good vanilla, I ask you, especially in Minnesota, which doesn’t exactly push the flavor boundaries? From Terrace Park Dairy, the largest in nearby South Dakota. Sometimes, we even had maple walnut or chocolate marshmallow. Be still my heart. And then I met my wife, and vanilla was no longer sufficient. I was introduced to Ben & Jerry’s and Vermont, and that was that. Ben & Jerry’s, lo these past years, has surely had a couple of hundred flavors. Some quite good; some perhaps too experimental. But, all made with high-quality ingredients, and that counts for a lot. 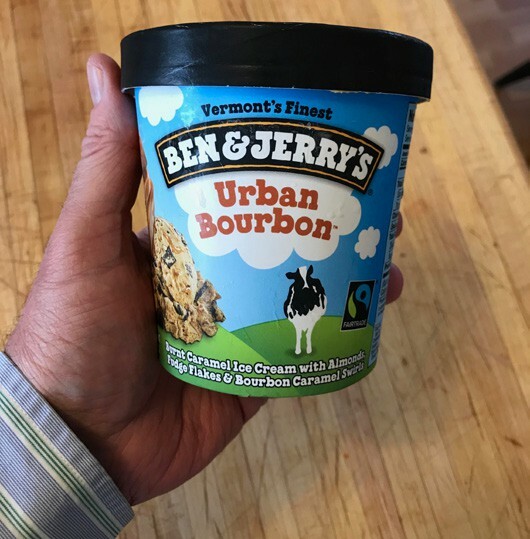 Sunday, our daughter did the shopping and came back with “Urban Bourbon.” I commend it to your attention as outstanding ice cream. Move over, maple walnut. Douglas Cunningham is editor and publisher. Reach him at doug@pcnr.com, or call 845-265-2468. Letters to the editor are welcome, and should be limited to 500 words.